Final Fantasy IV: The Complete Collection is one of those games I've had my eye on for some time but haven't picked up (well, until a few weeks ago) because I just wasn't interested enough in it (despite the fact that the SNES original is one of my all-time-favorite RPGs) to spend $19.99 on it. 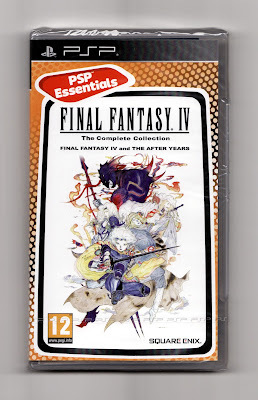 When I saw that some third-party Amazon seller was hawking this compilation--which combines Final Fantasy IV and Final Fantasy IV: The After Years onto a single PSP UMD--for less than $10, though, I couldn't help but hand over my hard-earned cash. The only hitch, which I sadly didn't discover until the game arrived on my doorstep, was that said Amazon seller wasn't hawking the North American release of Final Fantasy IV: The Complete Collection; rather, it was hawking the European release. Truth be told, I'd prefer to own the North American copy--mainly because I like its box art more than I like the garish art that graces the packaging of the Euro version. I don't think the North American cover art is worth spending an addition $10, though, so I've decided to keep, rather than return, the copy that can be seen on the right. Alas, I've yet to open my copy of Final Fantasy IV: The Complete Collection. (I'm starting to sound like a broken record in this regard, aren't I?) Rest assured that as soon as I do so I'll let all of you know what I think of this curious PSP release. Ahh Final Fantasy IV: the curious Final Fantasy that has yet to find the perfect port. The original version was horribly translated, the GBA version suffered from poor audio thanks to the system's speakers and awful slowdown that messed up the ATB bars, the DS version was super difficult and had an overly verbose translation, and the PSP version slaps on the misguided "After Years" alongside the same weird visual look that characterized the PSP remakes of FF1 and FF2. For a game that has seen so many releases, it's awfully confusing that it's yet to stumble upon the best edition. Kimimi: Yeah, I was a bit shocked when I first opened the package, as I expected the game to be the NA version. I didn't want to deal with returning the game and then finding another, similarly cheap copy on line, though, so I kept the Euro version. All that really matters is the game that's on the UMD inside the packaging, right? Justin: Yes, I agree! Now I just have to play the darn thing. I think it's going to have to wait until after Xenoblade, though, as that's taking all of my focus right now. Anyway, hopefully this will force me to finish The After Years. I played through a few chapters of the WiiWare version, but stopped for some inexplicable reason (well before the end). The artwork is fine,but ugh! Tacky border, "PSP Essentials" and bubble background is gross indeed! Nice, wish I could find it for a tenner! Well, keep an eye out for it, Retr0gamer, maybe you will :) It's not like the PSP is doing all that well anywhere outside of Japan these days, is it? Nope. I haven't even finished FFIV. I got to the moon and...quit. Oh, yeah, I forgot about that. Sorry for reminding you :( Anyway, it's too bad that the moon is what caused you to give up on the game. I remember loving that part when I played it as a teen, but I haven't gotten that far in ages so who knows if I'd still feel that way. I liked the moon section, doing all the optional bosses to get the crazy end game weapons was great fun. Me, too, Retr0gamer. Plus, it was kind of a unique setting for a RPG, at least at the time. Ah, so you've played this version of FF IV, Trxd? Sorry you didn't like it much. It definitely isn't as good as FF V, that's for sure, but I still like it quite a bit. Of course, I have a feeling nostalgia plays a pretty big role in my love for this particular entry in the series.